More inside baseball, but if you’re interested in this stuff, another writer at National Review Online also pans most of the rest of the Republican governors (and one speaker of the House) expected to run for president in 2012—Mitt Romney, Mike Huckabee, Newt Gingrich, Tim Pawlenty, Haley Barbour, and Mitch Daniels—as big-government conservatives (in which case, “conservatives”). Does anyone have an opinion on whether Rick Perry or John Bolton is a serious possibility? 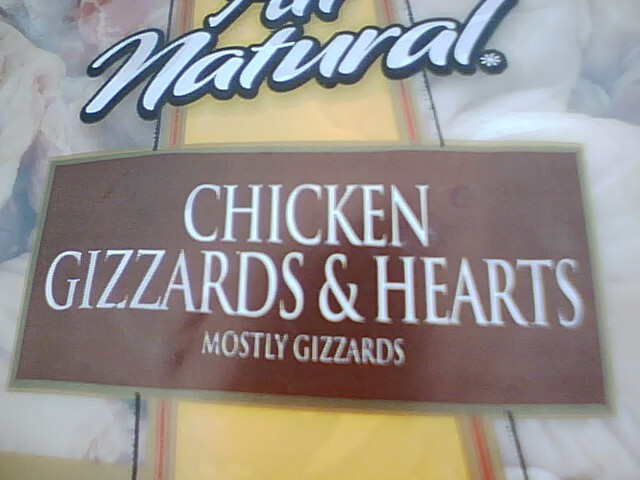 Chicken Gizzards & Hearts. Mostly Gizzards. I also like that “All Natural” gets an asterisk. It’s all natural, but not as natural as all that! President Obama finally gave a speech last night about his military action in Libya—what, ten days after American military operations started? If I remember correctly, we had to have the national debate about whether to begin the second Iraq War (which, unlike this, was arguably just a continuation and finishing of the first one) for at least the better part of a year, and liberals still decried the “rush” to war. I hope liberals will judge President Obama by the same standard. There was no mention of the Congress. Is he going to ever ask its approval? And if not, why the repeated emphasis on asking others such as the Arab League or the UN for their approval — given that their representatives, unlike ours, are largely not elected? Yes, come to think of it, President Bush also had Congress’s authorization for the use of force. Two months ago, someone shot a lot of people at an event in Tucson, Arizona, including Congressman Gabrielle Giffords. Six of those people died; many others were injured. Liberals argued that conservatives (e.g., radio-talk-show hosts) participate in the great national debate a little bit too boisterously, and that eruptions of such violence are a natural result of that debate (i.e., a natural result of what I think Mark Steyn has called the rough and tumble of a free society). Liberals talked about the need for “civility” in the national discourse, ambiguously attempting to deligitimize debate. A writer at National Review Online has more on America’s looming debt crisis, and a warning that Washington politicians may have to choose between balanced budgets in the near term and the structural reforms needed to make America solvent in the long term. Normally, I wouldn’t bet on politicians’ choosing the common good in the future over what makes them look good in the present, but America isn’t dead yet; so here’s hoping. [Senate Majority Leader Harry Reid] and too many other Americans seem to be living their version of the old line: If you owe the bank a thousand dollars, you have a problem; if you owe the bank a million dollars, the bank has a problem. America owes the world $14 trillion, so the world has a problem.